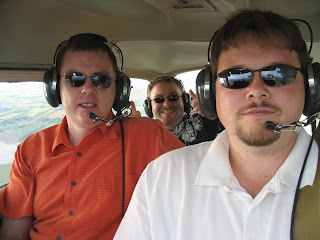 Me and a couple of buddies got up for a flight last weeknd. This was the first time that either of them had flown in a small non-commercial aircraft. It was about 30c on the apron and we nearly perished from the heat until I fired her up to complete my preflight checks. We taxied with my door open into position and then a few minutes later we were climbing out at a paltry 600 ft per minute. Fern did not like the heat one bit and her performance was way below normal. A few times during the flight I actually had to fly with my window open to increase the airflow in the cabin. We hit some of the tourist attractions located on our north shore and I circle a few of them so Dean could get some shots. It was a hot hazy day and the pics reflected this fact. I let Dean take the controls for a bit but he wanted me to do all the flying in case he did something wrong, (he admitted that he wife told him not to touch anything). When then pushed on to Summerside to give Dean a chance to take some shots of his house, then we swung down to the Confederation bridge and finally we returned to Charlottetown where I did a picture perfect landing. (Due to the pax load, nearly full tanks and hot conditions I found that I had to leave more then normal throttle on to reduce our descent rate on final). Another great flight and both of my buddies want to go again next month when it's a tad cooler and less hazy for picture taking.